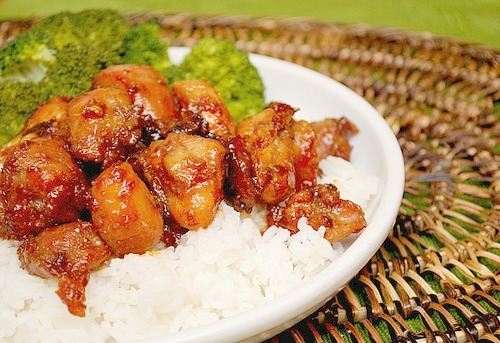 Vietnamese Style Caramel Chicken is a dish that consists of first making a simple caramel with brown sugar and water. Once the caramel is a rich deep brown color, more water, fish sauce, grated fresh ginger, garlic, red pepper flakes and chicken is added. After a few minutes, the liquid will reduce and eventually boil up to a sticky, salty and sweet sauce, resulting in a caramel type consistency. It's quite an intriguing recipe despite being so simple and straightforward. And it's amazing that this dish is done in less than 30 minutes too, making it great for the weeknights. I served this over steamed jasmine rice along with steamed broccoli. Add the chicken and broth into the IP. Using tongs, remove the chicken from the IP and leave 1/4 of broth in the IP. Press SAUTE and add sugar. Stir mixture until bubbling and very dark brown, about 6-8 minutes. Whisk in the 1/4 cup water, fish sauce, ginger, garlic, and pepper flakes. Stir in pressure cooked chicken and cook until the sauce is thickened and sticky and chicken is tender, about 3-5 minutes.